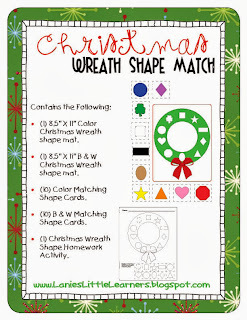 Christmas Wreath Shape Match cards are perfect for one:one correspondence, listening and following directions. (1) 8.5” X 11” Color Christmas Wreath shape mat. (1) 8.5” X 11” B & W Christmas Wreath shape mat. (10) Color Matching Shape Cards. (10) B & W Matching Shape Cards. (1) Christmas Wreath Shape Homework Activity. It is suggested to print all pieces on card stock and laminate for durability except for the homework sheet. Once laminated, cut along the dotted line.